At home, hardened police detective Aidan Breslin (Dennis Quaid – Enemy Mine) has grown increasingly distant from his two young sons Alex and Sean since the death of his wife. At work, he finds himself thrust into an investigation of perverse serial killings rooted in the Biblical prophecy of the Four Horsemen of the Apocalypse: The White Horsemen, a master of deception and the unexpected leader hell- bent on conquest; The Red Horsemen, a sharp-witted warrior intent on turning man against man, with an innocence that hides a burning rage within; The Black Horsemen, a manipulative and dark tyrant, unbalanced but always one step ahead; and The Pale Horsemen, an executioner with disarming strength, determined to spread death through surgical precision. As Breslin grapples with each new revelation in the case, he slowly discovers a shocking connection between himself and the four suspects. 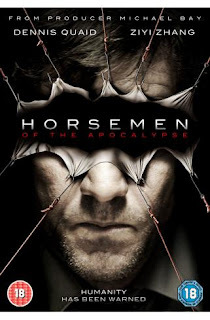 Horsemen is well acted, well produced, and slickly put together, but unfortunately held back by the storyline. It’s not that it’s bad, or completely unoriginal – it’s just that we’ve been down this road a hundred times before now, and the only thing worse than a hack movie, is one that believes that it’s original – and unfortunately this applies to Horsemen. Grumpy, work-obsessed detective, neglecting his home life due to the case he’s working on? Check. Killer leaving puzzling clues at the crime scene to guide the cops to the next one? Check. Lead character has an ethnic minority partner? Check. Killer becomes entangled with the detective’s family? Check. From the fifteen minute mark, you know where it’s going. There are a few surprises along the way, but they don’t change the structure of the narrative in anyway – they’re just window dressing. Violence: Some gun and knife action, and some extended torture sequences. Prepare for a spooky treat this Halloween as Warner Home Video serves up a frightful feast of nerve-tingling nightmares in high-definition as Gremlins, Friday The 13th and Ghost Ship are released on Blu-ray. Lock the door, turn out the lights and settle down for the scariest night of your life with this trio of terror. Boasting the finest in psycho killer action, demonic creatures and miniature green monsters, prepare to be amazed by the crystal clear picture quality and surround-sound of these Blu-ray horror classics. Remember the rules? Don't ever get it wet. Keep it away from bright light. And the most important thing - no matter how much it cries, no matter how much it begs... never, ever feed it after midnight! Yup, the Gremlins are back in town. Fresh from a 25th anniversary spruce up onto Blu-ray – now complete with a remastered Dolby® True HD soundtrack – they’ve never looked and sounded more mischievous. Set in the bowels of an eerie cavernous ship and featuring plenty of blood-curdling demonic action, Ghost Ship is a must-have for your collection this Halloween. Watch in stunning high-definition as a salvage crew encounter paranormal happenings onboard the lost ship, Antonia Graza...with catastrophic consequences. Prepare to jump out of your skin as the slasher classic, Friday The 13th, comes to Blu-ray - now boasting new, previously unseen, extra content. Watch the body count rise with the film that sparked off a whole cult series of movies throughout the 80’s. With stunning high-definition clarity you’ll experience every grizzly murder and spine-chilling scream as never before. You’ll never want to camp in the woods again! Thanks to our friends at Warner Home Entertainment, we've got a complete set of Gremlins, Ghost Ship and Friday the 13th to give away to you! For your chance of winning one, send us an e-mail to blurayhorrorbundle@rocketmail.com with your name and postal address before midday on Monday 26th October (UK time). The first name drawn out of the electronic hat will win a free copy of each of these three Blu-Ray discs! When Rob Van Dam left WWE, the fans were very keen to see his return. When he began RVDTV, it wasn't quite what the fans of Van Dam were clamouring for. However, the series has been sufficiently successful online that a DVD set collecting his favourite episodes into a ten-episode set, showing RVD's more private side to a soundtrack that sounds like it could have been written by the B52's. Firstly, it has to be said; Rob Van Dam is a VERY clever guy. He's painted as a stoner in WWE, but it's clear from listening to him talk on this DVD that he's a very intelligent guy. From his explanation of the choice of the Tao as his emblem all the way to his "Friends in High Places" segments where he debates certain key points (bad language and gun control) with his celebrity friends, it's clear that Rob Van Dam has been typecast as the stoner personality in wrestling wrongly, and that given the chance he could run with a pretty decent promo (just like in his ECW days). This DVD collects a weird and wonderful selection of episodes. In this DVD, you will see Van Dam discuss language censorship, go through his various workouts and meet his Hollywood friend Dave Defalco and see his mansion filled with movie memorabilia. All the way through, RVD is joined by several friends from different realms of the entertainment industry. You'll see all sorts, from fellow wrestlers to musicians and UFC fighters. Ultimately, as a biography for Rob Van Dam, this DVD is really enjoyable. As stated above, the DVD reflects RVD's considerable intellect. As a DVD with some instruction for those looking for a good workout or some experiences from a professional wrestler, it's also got some value to it. However, the DVD is really only for wrestling enthusiasts, and realistically will have limited scope and interest to anyone bar fans of Rob Van Dam or some of the wrestlers who appear in the episodes. Violence : A miniscule amount, surprising really. Swearing : A fair amount of swearing, especially on the episode regarding language censorship.